Oh Harry Harry! Harry-Harry-Harry-Harry-Harry Hodge! | Through the seasons before us..
Oh Harry Harry! Harry-Harry-Harry-Harry-Harry Hodge! I was quite unashamedly excited by this prospect, for some reason. Steve Hodge isn’t a name you often see on the ‘Evening with..’ circuit, indeed, he’s not one that you often see kicking around at all compared to other former players. And he was my first ever ‘favourite’ player (he was quickly usurped by a certain Mr Pearce as my fickle childhood love affair with Forest blossomed, but still!). He had two spells with Forest in the eighties under Brian Clough, and was a key member of what many consider to be Clough’s second great Reds side. Of course, playing in an era when European football was not available to English clubs for much of the time, ‘Harry’ Hodge was limited with his opportunities to test his skills in Europe, although of course he was distinguished with England caps to his name. A Nottingham lad, he joined the Reds in 1980 as an apprentice and debuted in 1981-82, before making a place in midfield his own the following season. He was a cracking goal creator, and also chipped in with a few himself too. 1985 saw him move to Villa for £450k, who sold him on a little over a year later to Tottenham for £650k where he played alongside the likes of Chris Waddle and Ossie Ardiles. He also travelled to Mexico for the World Cup in 1986 – and not only played in that game against Argentina, he managed to snag Diego Maradona’s shirt after the match. He resisted the urge to burn it (or worse! ), and it is currently on an indefinite loan to the National Football Museum (although I didn’t notice it when I was there back in March). Then he came back to Forest just in time to make an impression on this author as he started out his life as a Forest fan, cast out of the England team he was integral in the Reds haul of trophies in the late eighties, seeing us win numerous trophies – and earn a recall to the England squad for the 1990 World Cup in Italy, but an injury meant he game home having never had a chance to contribute on the pitch. After the emergence of a certain Mr Roy Keane it became increasingly tough for Hodge to force his way into the Forest side ahead of him, he only appeared as a sub in the 1991 FA Cup final against Tottenham before being sold on to Leeds for an impressively large £900k, ending up on loan at Derby before being released to QPR then joining Watford, and having short-lived dalliances in Hong Kong and finally at Leyton Orient. 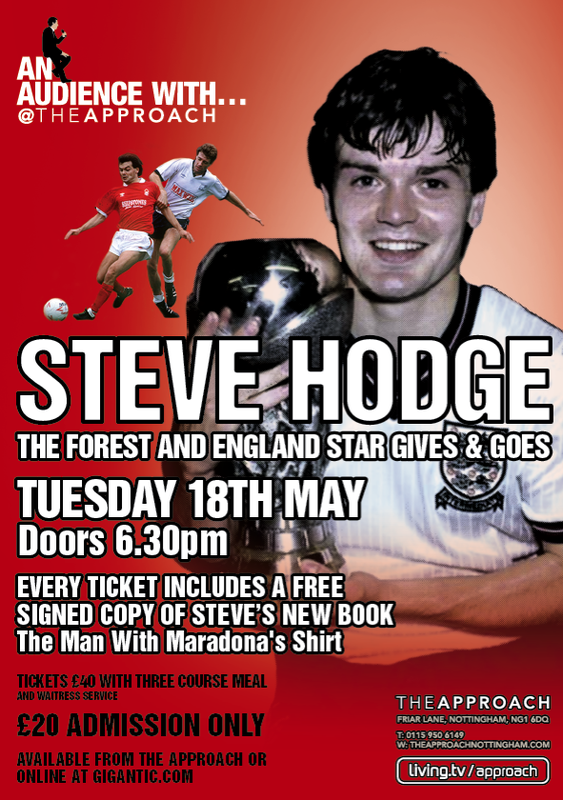 So it’s the 18th May he will be appearing at The Approach – and for a £20 ticket you will also get yourself a signed hardback copy of his new book ‘The Man with Maradona’s Shirt’ – which should hopefully be a good read! I’m really looking forward to both the evening and getting my mits on a copy of his book too. You can book tickets online through Gigantic by clicking just here. Get all the details by clicking on the flyer graphic above, or just here. He’s a match day host in the 1865 club (old legends lounge). He’s fantastic on the mic in there, so looking forward to this! Very fond memories of hodgie he had a cracking left foot scored plenty of goals and had a good footballing brain.I wont be there but enjoy all those who attend. Just think nffc we might be a premiership club again by this date i think ? Thanks for this NFFC. I might just be tempted to venture out to listen to Harry. I too have extremely fond memories of the man. These days when the call called pundits talk about midfielders “drifting” past fowards to get in goal scoring positions, then they might as well have Harry in mind. He was the original “3 lung player” for me. Hence his name I guess. One minute on the goal line next up front in a goal scoring position. Lets hope he gives us a good night out. had a executive box at the england v france under 21’s this time last year and he paid us a visit before KO – hodgy spent about twenty minutes with us and must say he was absolutely brill dishing out cracking stories…..